In the event of a zombie-based outbreak, certain precautions must be taken. In the event that these precautions are not taken, the total collapse of civilization is likely. The end result is portrayed on the Zombie Nation T-Shirt. This simple tee shirt depicts the possible result of a zombie outbreak in which the nation fails to respond swiftly or sufficiently to a zombie outbreak, resulting in a cataclysmic outbreak of nation-destroying proportions. 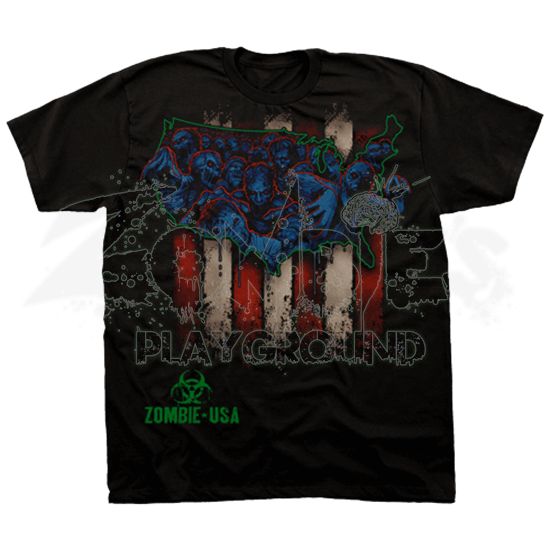 The shirt proudly displays the outline of the continental United States outlined in green, filled with a blue-toned image of her poor, hungry masses - poor because zombies do not use money and hungry because they are always hungry for flesh. Each individual zombie is outlined in red, so that you can pick them out and clearly distinguish that there are, indeed, a lot of them. Behind the silhouette of the USA are the tattered red and white stripes of a flag, hung vertically. And in the bottom corner, written in green, is a biohazard symbol with the words Zombie USA. 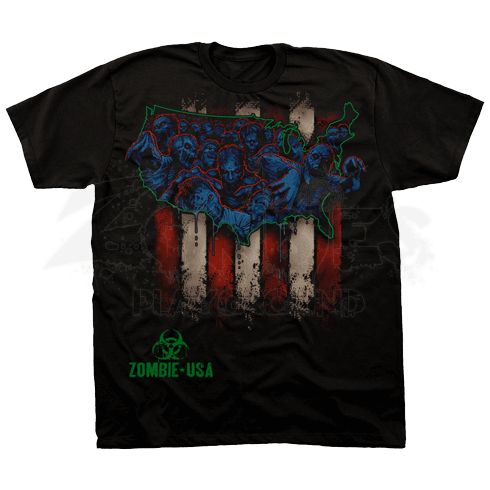 Does the Zombie Nation T-Shirt depict the possible outcome of a zombie outbreak in the USA? Maybe, maybe not. Who can really say for certain? But it is undoubtedly a wickedly cool tee shirt to wear on a daily basis.